According to the ancient principles of Feng Shui the kitchens represents prosperity, nourishment and health, as it is the heart of the home. “Feng” means “wind” and “Shui” means “water”. In Chinese culture, gentle wind and clear water have always been associated with good harvest and good health; thus “Good Feng Shui” came to mean good livelihood and fortune, while “Bad Feng Shui” refers to hardship and misfortune. Your home is merely an outward reflection of what is happening on the inside. Feng Shui is a branch of Chinese Medicine with a foundation similar to that of acupuncture as both deal with moving blocked or stagnant energy called chi. Blocked or stagnant chi in the body can cause fatigue and compromise the immune system causing health issues, and the same applies to the energy of your home or office. A home with good Feng Shui has a higher vibration because the energy is balanced. In a balanced home you will feel more at ease, life tends to flow smoother and bring more peace to those inside the home. Classical Feng Shui Specialist and Green Realtor, Angela Sabatasso recommends making these small shifts to your kitchen to raise the vibration in your own home to serve you and your family in the best way possible. 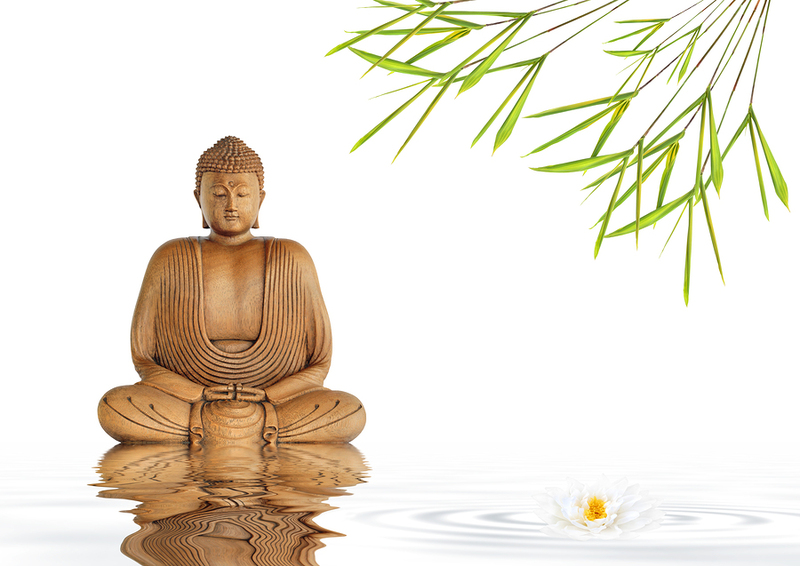 Zen abstract of a buddha in prayer in a garden with bamboo leaf grass and lotus lily flower with reflection over rippled gray water over white background. - Keep the stove clean and in working order at all times; it represents wealth and is a reflection of what is going on in your life. - A shiny metal surface or mirror behind the stove doubles the energy. Symbolizes doubling your income. - An unused stove implies untapped resources or ignored opportunities, make sure you use it often. - Keep food fresh and remove all old or stale items promptly. - Minimize the use of magnets, as they tend to attract people and encourage unnecessary eating. - Avoid red, pink, or purple walls; these are fire colors. Fire colors can be agitating and cause overeating. - The best kitchen colors are white, blue, green, or soft earth tones. - A round dining table is best for digestion and communication. - Keep dining table clutter free for better digestion. - Fire and Water fight each other, so placement of stove and sink is important. - If you are just building a home, it’s better if you don’t see the kitchen immediately upon entering the house, as this can lead to digestive, nutritional, and eating problems. It also encourages guest to leave immediately after eating. Brought to you by: Homes and Harmony Feng Shui, Angela Sabatasso, Green Realtor and Classical Feng Shui Specialist.